Finding the right foundation or concealer can be tough. Finding one that blends with your natural skin tone can be even tougher. Fortunately, with Becca Cosmetics you can finally achieve that beautiful you as you are meant to be. With over dozens of choices in a variety of shades, Becca delivers on its philosophy of creating a “natural, flawless look.” Elevate your style and natural beauty and see how putting on Becca makeup is not the same as putting on makeup. Frustrated by her own fruitless search to find the right foundation, Australian makeup artist, Rebecca Morrice Williams, coupled her passion with persistence and invested six years into scientific research and development to create the Becca makeup line. Offering women radiant, even skin tone with a perfect color match, Williams developed a foundation which conceals blemishes and looks fresh all day while feeling weightless on the skin. “My search for the ‘perfect foundation’ became a mission that was to prove as elusive as the search for the Holy Grail!” – Rebecca Morrice Willams, Founder of Becca Cosmetics. 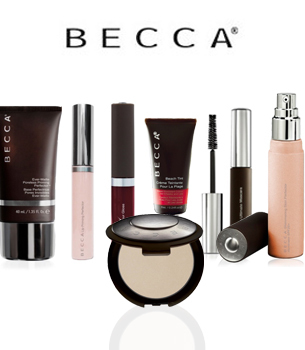 Regardless of ethnicity or age, Becca Cosmetics offers all women the opportunity to look flawless and natural. To achieve this, Becca makeup offers the 3-Step Skin Perfecting Makeup System to correct, perfect, and enhance any complexion from light to dark tones. Becca Cosmetics reaches across global lines to makeup artists, beauty editors, celebrities, and women who desire the selection and quality Becca Cosmetics offers. The recipient of beauty magazines awards from InStyle and Elle, Becca Shimmering SkinPerfector highlights the skin while diffusing uneven skin tone making Becca Shimmering Skin Perfector one of the company’s bestselling products. Becca Shimmering SkinPerfector incorporates antioxidants known to fight wrinkles and fine lines while providing a radiant, smooth complexion. Becca Cosmetic’s distinctive Dual Coverage Compact Concealer offers the ability to customize color and coverage. The unique split-pan packaging allows layering and blending of highly pigmented shades to create a custom color for any skin tone or color. The Becca Cosmetics Dual Coverage Compact Concealer offers a lightweight texture that won’t settle into fine lines or wrinkles, is water-resistant for lasting wear, and is paraben-free. Enriched with anti-aging ingredients including vitamins C and E, Becca Cosmetics Dual Coverage Compact Concealer offers natural antioxidants to brighten skin and correct uneven skin tone. “While many cosmetic companies offer three to seven colors, Becca makeup offers a multitude of concealer and foundation colors. The complete Becca makeup system offers women the ability to flaunt a radiant, shimmering, well-matched complexion,” stated Raichel Goodyear, Esthetician at DrSkinSpa.com.